From natural contemporary to country to casual, woven wood window shades and blinds at Houston Blinds For Less add a striking element to any space. Bring the beauty and simplicity of the outdoors inside to add privacy and create a relaxing atmosphere in your home or office. Woven wood shades at Houston Blinds For Less are crafted from natural renewable resources like bamboo and grasses. Not only are you adding elegance to your windows, you’re helping to sustain the environment. With available styles such as the Roman shade and valance, woven wood window shades can fit anywhere. At Houston Blinds For Less, we offer an excellent collection of woven wood window shades and blinds from leading makers, including Levolor, Hunter Douglas, Graber, Timber Blinds, Bali, Woodlands and Mecho Shades, which specializes in customized, motorized window shades. You can add the natural beauty of woven wood shades to French doors, sliding glass doors and windows, including bay windows and corner windows. 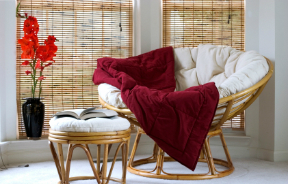 Durable, woven wood shades are soil and dust resistant and easy to clean. They also hold up beautifully over time. The available top down, bottom up option is great for blocking light and adding privacy at only the top or bottom of a window. Other options include a 2-on-1 headrail and edge binding. We also offer shades and blinds with an available continuous cord loop system. This system opens and closes the shades smoothly and easily and eliminates the excess cord of a raised shade. 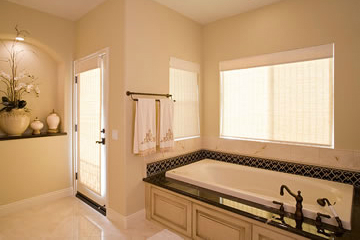 Choose woven wood window shades from a variety of sizes, styles and combinations of materials and colors. For more privacy, consider affordable, functional and stylish privacy lined woven wood shades, which have an attached or detached liner. 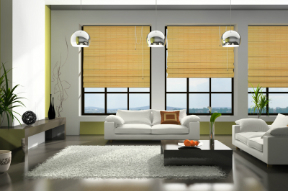 If you are not sure which woven wood window shades to select, Houston Blinds For Less can help. Contact us now to schedule a free consultation at your Houston area home or office or stop by our showroom in Pearland. We can show you samples and answer any questions you might have.